Retired--Now What? : Who Knows GMOs? Welcome back. In an earlier blog post (Science and Society), I highlighted Pew Research Center surveys from 2014 that measured agreement with several statements, including It’s safe to eat genetically modified foods. At the time, 88% of U.S.-based scientists agreed with the statement compared with only 37% of the U.S. public. The 10 genetically modified crops available in the U.S.: corn (field and sweet), soybeans, cotton, canola, sugar beets, alfalfa, papaya, squash, apples and potatoes (from gmoanswers.com/current-gmo-crops). While those surveys set a marker for scientists versus the general public, Pew surveys of the American public in 2016 and 2018 found those who believe genetically modified (GM) foods are unhealthier than non-GM foods increased from 39% to 49%. Scientists weren’t surveyed separately, yet additional survey questions established that the increased concern about GM foods was primarily from those with low levels of science knowledge. There was essentially no change from those with high science knowledge. 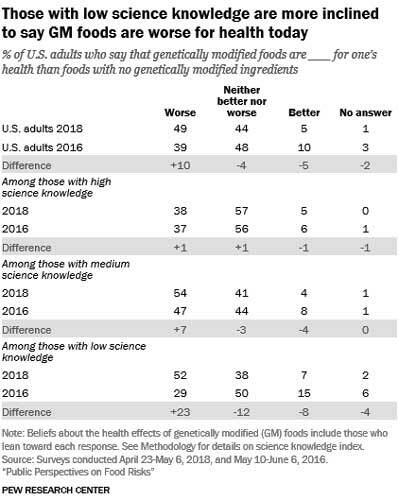 Comparison of 2016 and 2018 Pew Research Center surveys of U.S. adults regarding health effects of genetically modified foods, categorized by respondents’ science knowledge (from www.pewresearch.org/science/2018/11/19/public-perspectives-on-food-risks/). Given those results, I suppose we shouldn’t be too surprised that a recent study found the most extreme opposition to GM foods was from those who think they know the most--but actually know the least--about GM food science. I’ll review that study after a look at GM foods. Genetically modified organisms (GMOs) are plants, animals and microorganisms whose genetic material (DNA) has been altered in a way that does not occur naturally or through traditional crossbreeding. Selected genes are transferred from one organism into another or between unrelated species. The goal is to proffer some advantage, such as crop protection from disease or insects. Foods produced from or using GMOs are referred to as genetically modified or genetically engineered foods. The scientific consensus is that GM foods pose no greater risk to human health than conventional foods and can provide substantial benefits, but that each GM food needs to be tested before it’s introduced. GM food safety testing normally covers direct health effects (toxicity, allergenicity), specific components thought to have nutritional or toxic properties, stability of the inserted gene and any unintended effects of gene insertion. The assessment of extreme opponents to GM food was conducted by a team of researchers from the University of Colorado, Boulder, Washington University in St. Louis, the University of Toronto and the University of Pennsylvania. They initially surveyed a representative sample of 501 U.S. adults asking two questions about GM foods: opposition (1-none to 7-extreme) and concern (1-none to 7-extreme). Next, they asked participants to rate their understanding of GM foods (1-vague to 7-thorough). Finally, they tested the participants’ scientific literacy with 15 true-false questions drawn from such sources as the American Association for the Advancement of Science Benchmarks for Science Literacy. Five of the 15 items concerned genetics (e.g., All plants and animals have DNA). The results showed that as opposition to and concern about GM foods increase, knowledge about science and genetics decreases; however, perceived understanding of GM foods increases. In other words, extreme opponents know the least, but think they know the most. The researchers conducted a parallel assessment using nationally representative samples from France (500 participants), Germany (519) as well as the U.S. (540). Objective genetics knowledge was measured with 10 true-false questions. Self-assessed knowledge was measured by asking, “How much do you know about genetically modified food?” (1-not at all to 5-a great deal). Extremity of opposition was measured by averaging across 12 items that encompassed reluctance to buy, desire to regulate and willingness to oppose GM products, for example, through public demonstration. The results were similar to the initial U.S. assessment. Across the entire sample, and controlling for country, extremity of opposition and self-assessed knowledge increase as objective knowledge decreases. Predicted relationships between extremity of opposition and both objective and self-assessed knowledge by country; shading represents the 95% confidence interval (from www.nature.com/articles/s41562-018-0520-3). Although the study focus was on GM foods, the researchers also surveyed for concern about and belief in human-caused climate change. The direction of the effects was the same, but the results were not statistically significant. 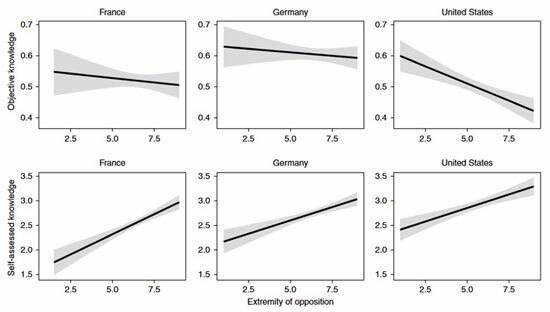 Unlike beliefs about GM foods, whose opposition was shared by liberals, moderates and conservatives, climate change beliefs were highly polarized by political identification. Conservatives were much more likely to oppose the scientific consensus. The researchers posit that, for highly politicized issues, ideological commitments may supersede individual knowledge.